It was a good day today–we put up our first hay. We cut it with the bush hog, raked it with a rake we picked up at Faul’s in Lake City, and then put it up loose. By not using a baler, it is a relatively inexpensive way to make hay. While we were working on this project, I was thinking about equipment maintenance. I’ve noticed that some folks don’t really believe in maintaining their equipment. They don’t grease and oil things; they don’t protect them from the rain; they don’t fix broken parts and as a result, equipment beats itself to bits. That is what someone did to the rake we bought, It was beat up. The bearings are shot. However, it was worth every penny of the $400 we paid for it. And, we will take care of it. We are like Phaedrus in “Zen and the Art of Motorcycle Maintenance–we take joy in the hum of well-maintained equipment. Two weeks ago we had a flood that forced us to finally accept that times are not right for us to have a profitable farm. Although up until then we hadn’t yet given up, a quick glance at our records and accounting would have shown what was in the cards. Up until two weeks ago were were still thinking we could make a go of this. John had completed our roadside stand; the chickens were producing eggs; the garden was going bonkers (we finally figured out a way to keep the chickens out of our veggies.) Then, we had 16 inches of rain in 27 hours. In that short time we lost most of our garden and our hope for sale-able produce. In addition, the chickens were traumatized and egg production went down the drain. 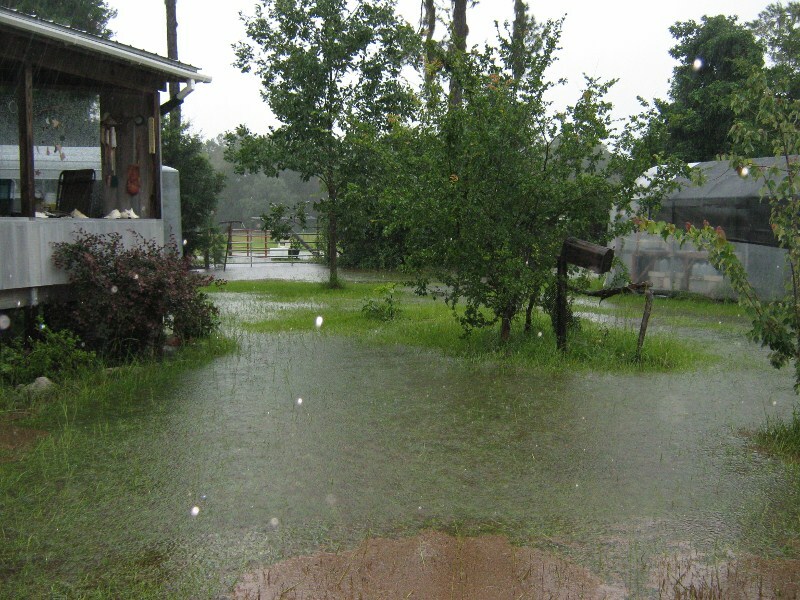 In addition, animals driven by the rising waters to higher ground finished off the blueberries. The rains were too late to save the blackberries decimated by months without rain. It was too much too late. However, this isn’t the end of our farm. It is just a temporary stay in our efforts to be profitable. It is a switch to what the tax man calls “hobby farming.” For now, we will put most of our energies into other endeavors–blacksmithing, teaching, yoga, and other projects. Meanwhile, we will continue to experiment with sustainable methods and let the farm help us cut our food bill and provide us with heathier choices. And, some day, it may be profitable to have a small farm. When that time comes, we will be here ready to begin again. Today as we were working with our french drain compost piles, I was thinking about the cycles of the earth. With apologies to the Suwannee Bicycle Association, they are not the cycles I was thinking of. I was thinking of a question a friend asked a few weeks ago–how do we improve our soil. I tried to explain but he didn’t seem to get it so I was considering how I could better explain. I think the problem is that there is a simple, commonly accepted way to improve soil nutrients. Simply add 10-10-10 to the soil–what I call the “Git-ur-done” method of soil improvement. It is fast, easy, controllable so why wouldn’t we want to do this? My reply was that while this is one way to insert nutrients into the cycle, a method used by many folks, we had chosen to move to a different point on the cycle to interject the nutrients. We interject them through our livestock (see the deer in the image.) It was in there somewhere that I felt I had not explained myself. Here’s where we all agree–the nutrient cycle is a closed loop–nothing is created but only recycled. In order to improve the amount of nutrients available in the loop, some must be inserted. We agree but we insert the nutrients into the animals rather than directly into the soil. In other words, calcium deficient chicken raised on calcium deficient soil will lay calcium deficient (easily broken) eggs unless their diet is improved. (We use oyster shells.) If their diet is improved, excess calcium will be defecated which will improve the soil. Similarly, cattle raised on mineral-poor soil will lack minerals. If their diet is improved by adding to the grass they are eating (we use molasses), the extra minerals are defecated into the soil. Even better, if their bones are returned to the soil, the soil becomes even richer with all the vitamins and minerals which means the soil is more able to support the next generation without amendments. So, rather than feed our soil, we feed our animals. We feed alfalfa cubes and vitamin rich food wastes. We feed grain to our chickens. We feed them our neighbor’s corn husks and cobs–corn that was fed by him. We then use the animal wastes to feed our soil which then feeds the plants our animals eat so that their diet is improved. That is the cycle I was thinking about this morning and that I tried to explain to our friend. It is true this approach is slow. The soil is built up over years rather than days. But, this slow approach and cyclical thinking is central to sustainable farming and sustainable living. Perhaps our pace of life is an anachronism like our unwillingness to carry a cellphone everywhere we go or our willingness to live in an old small manufactured home. Perhaps it is because we are odd that it is hard to understand what we are seeing and doing. Regardless of the reason, I truly believe it is worth trying to explain–more and more folks are thinking oddly like us. Calfie (the last of our pregnant cows/heifers) had her baby Thursday. Calfie (Rosie’s daughter) gave us our first girl calf. We named her “Fly” partly because she is so cool and partly because the mild winter did not kill all the stable flies so she is…”fly.” Sorry, too much time at the farm will do that to you. In this picture, Fly is about 25 minutes old. 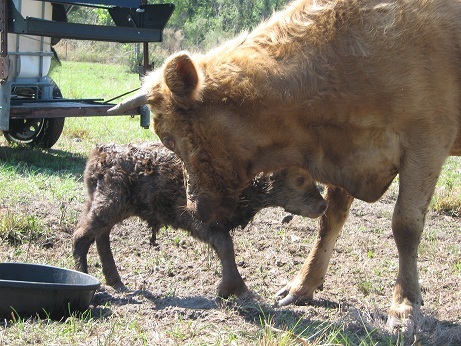 She is the first baby for Calfie (and she is a female) so she is not as large as the bulls were when they were born. She is also the first truly brown calf we have had. What a little cutie! It has been interesting watching her with the herd. They were SO excited when Hoppy was born and still very interested when Dusky joined the herd. However, little Fly’s presence garnered interest only from the calves–everyone else has become quite blase’. When I logged on today, I saw that we are having record spring temperatures across the country. So, I expect most people who have been outside today experienced what I experienced–spring is in the air. One of our broody hen’s chicks have been hatching. She started the day with one baby and is already up to 3. Our youngest heifer will have her calf any day now. The pears, blueberries, apples, and plums are in full bloom and the blackberries will join them soon. So, as I was weeding and hoeing–preparing for the next rain and for planting seedlings next month–the feeling of spring across our country was on my mind. I was thinking, spring is a time when things look bright (literally and figuratively). It is a time when we think about growth and not weeds. It is a time when the future looks sunny, and we don’t care to think about the potential of one more killing frost. Though we may know in our hearts it is still early and cannot yet last, it is a time when everything looks fresh and new and possible. And so, our nation’s politicians should take note. This is not the time for the “I have a nightmare” speech. This is not the damp and dreary gray of winter. It is “I have a dream” time. Because, at least for today, I can once again envision a country that is full of the promises of spring. I hope you feel it too. We are enjoying the calves. Here’s the latest picture of Hop-Along and Dusky. Spring is in the air. Oh, I know it is all a joke from Mother Nature and that we will get a killing frost (or two or three) before the true spring is here but that isn’t really the spring I am talking about. I’m talking about that spring that brings the promise of new hope, new starts, and bright horizons. It is no coincidence that Easter is in spring. 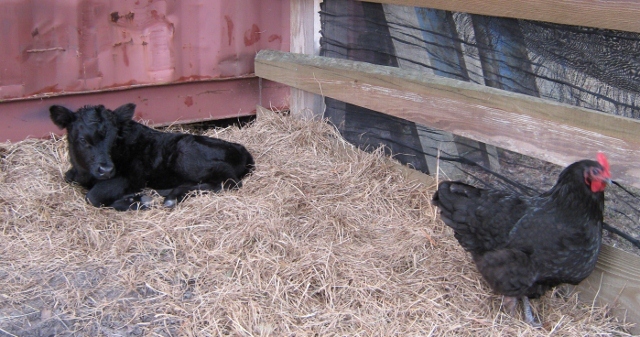 Last evening our cow Rosie (aka “Mama”) had her calf. It was a struggle as she pressed and groaned and strained. 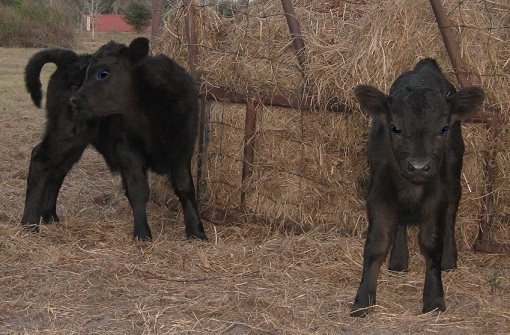 The calf has a large head and front feet (the part that is born first). When it became obvious that a little tug would be much appreciated, I grasped the baby’s hoofs and with the next contraction, pulled slightly. Two of those assists, and we had a healthy calf. John and I enjoyed a glass of wine as we sat in the settling dark outside the corral. We’ve named the calf “Dusk.” We think he is a boy. Of course, with a boy calf comes the knowledge that he will likely be in the freezer come this time next year. That would be sad news except that it also means Winston can continue to live. If he was throwing girls, Winston would have only about a year and a half before he would be headed for the freezer. Genetics. But for now, the babies are cute, the grass is green, and everyone is happy. What a great reminder to live in the moment. While the cows have been busy, John and I have also been at work. We have been finishing the job our dear friend Eileen helped me start–weeding the blueberries. It is nasty work involving lots of pulling of prickly and thorny plants, digging with tools and hands, sweating, fire ants, and using muscles we don’t generally use. However, I think Eileen would agree that it was actually fun. We chatted and planned and kibitzed and gossiped as we worked. When we finished, we stood back to enjoy the sight of clean rows and happy blueberry plants. There is a sense of accomplishment that comes with farming that is all too rare in other professions. Meanwhile, the chickens have also (finally) gotten to work. I don’t know if it was the slaughtering we did last week or the feel of spring in the air, or the fresh grasshoppers that have started to appear but they are finally getting off their toofusses (or should I say they are getting on them) and laying some eggs. Yeah!! Last week as I was working on the taxes and facing the yearly reality of trying to make a profit in farming (or just break even! ), I was feeling a bit down but this week all things seem once again to be possible. Perhaps that is the real reason people like us continue to work so hard to make a farm–the unmitigated joy of new hope. I apologize for my last message. Sometimes in December when the days are short and the sunlight is scanty, it is easy to feel overwhelmed. 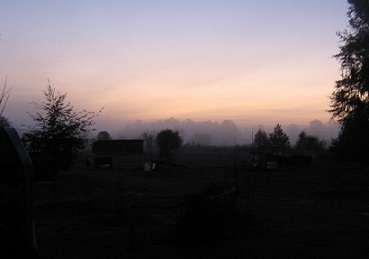 This morning, I heard the guns from the deerhunters, I heard something making a haunting cry, and I saw the sun rise. Life goes on. This morning I was thinking about how my generation (lagging boomer) was all about reinventing ourselves–which for many of us meant “throwing off the oppressive shackles of family histories” and moving to someplace where we can begin anew. I see generations younger than me who seem to understanding that we cannot avoid our history so we have nothing to gain by all this frantic movement. Instead we lose our roots–our connections to a people and place. As I grow older, I see the tragedy in that. John and I lived the longest we have ever lived anywhere when we lived in Waycross. Leaving Waycross meant leaving a history we share with many, many students. I find I miss that sense of shared history and it has encouraged me to commit the necessary energy to making a history here. We already have the beginning of roots. We spent so many years connected to this area through our friends–Eric and Becky Larsen, Johnny Bullard, the Prices and the McKenzies. We have a history with the Suwannee River. We our connected to our land. And we have the opportunity to broaden those roots through connections with young people in our local schools. I think I see a new year’s resolution–and a new year–rising with the sun. I started to type the explanation but, you know what, I don’t even want to try. It’s all good. It’s just the final straw, not the biggest. This is just me starting to admit what I knew all along.